The BBC gossip page continues to be a haven for fake news and transfer balls. Today the BBC tells us: “Liverpool are considering a move for Gent’s £13m-rated Moses Simon, 22, with Newcastle and Brighton also interested in the Nigeria winger.” Who is Mosses Simon? And why would Liverpool want him? Liverpool are said to be considering a move for Nigerian star Moses Simon. 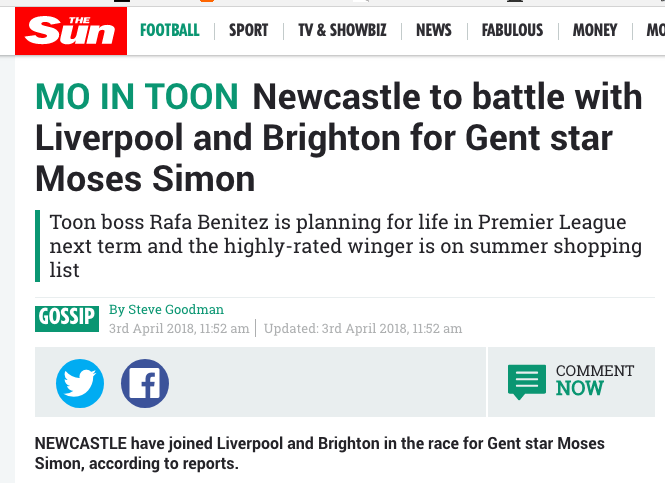 Simon is thought to be on the radar of Newcastle and Brighton but Liverpool have now entered the running. Belgian outlet Het Laatste Nieuws claim the Premier League trio are all monitoring the winger, who could make Nigeria’s World Cup squad. Simon is likely to cost around £13million, should he move on. Nope. The Mirror links to the story on HLN – the same story we can see above. HLN makes no such claim. But here it is again in the Sun. The paper’s source? The same HLN article that makes no mention of Liverpool. He’s wanted by Liverpool? Says who? Although, after claims made by the Sun, this could happen anyway. Because it is understood that Liverpool are also very interested in a player who could provide a test of Mike Ashley’s ambition due to his £13 million price-tag. A link directs readers to the Sun’s article – the one based on the non-existent story on HLN. And apart from the bit about the report on Het Laatste Niews linking Moses to Liverpool, it’s all true. 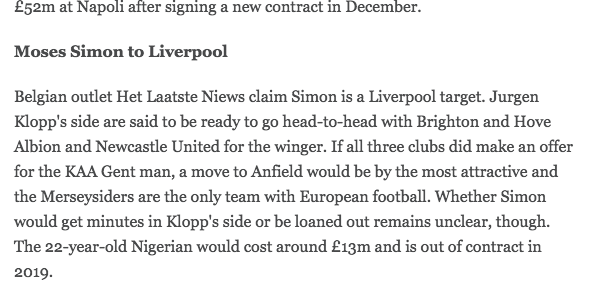 Belgian outfit Het Laatste Nieuws, as quoted by the Daily Mirror, is reporting that Liverpool FC are one of a number of Premier League clubs interested in Simon. But HLN never said anything about Moses Simon joining Liverpool. The Mirror’s story is bogus. But never minds the facts – get a load of the clicks.